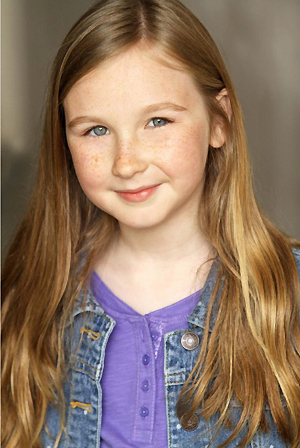 Welcome to Movie Vine, Meyrick Murphy! It’s a pleasure to have you. So, I must tell you right up front that I’ve become a very big fan of yours since you appeared on The Walking Dead. You were on the show for a short time but you made a huge impact. In fact, your character, Meghan, is essentially the Governor’s guide back to humanity. How did it feel to play such an important role in the show? Meyrick Murphy: Thank you! It was just amazing. Well, Meghan never experienced any of the creepy Governor. (But the eye patch should have been a clue.) He was really like a father to her. David Morrisey was really like a dad to me on the show. All of the crew called him my set-dad. He was always concerned when I had to do stunts. He always made Russel Towery, the stunt coordinator, double check to make sure they were extra safe. He even taught me how to play chess in between takes. The night it aired, I got a lot of attention I wasn’t used to, and it was all so new to me. I didn’t pay much attention to the size of my part on set. I was paying more attention to all of the fun and the experience—like putting worms on Coleman—the actor who played the walker that attacked me in the mud. MV: We’ve spoken with other actors from the show in the past and they’ve all given high praises for the crew and cast and have been very happy with the storytelling, even up to their character’s departures from the show. How do you feel about Meghan’s time on the show? 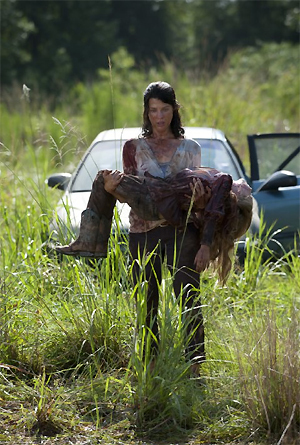 Did you like her storyline with her family and the Governor? Audrey Marie Anderson and Meyrick Murphy in The Walking Dead. Meyrick Murphy: It was a wonderful storyline; Nichole Beattie, Curtis Gwinn, Seth Hoffman, and all the other writers did such an incredible job. They are great at what they do. I think the Chambler family was a good family! You put an everyday average mom together with a cool aunt, a dying grandfather, a mysterious guy with an eye-patch, and a scared, confused little girl and you get a really diverse, interesting family. Meghan’s time on the show was brief, but I still think that the character went through a lot of transitions. Towards the end of her story she was braver. The cast of the show is amazing but the crew makes everything possible. They take care of every little thing, including Meghan’s stuffed pig, Carrots. I made lots of good friends with the crew. I never saw a frowning face. MV: You’ve gotten to work with really popular and talented actors and actresses. Did you learn anything from them while you were on the show? Meyrick Murphy: Oh, definitely! Between David, Alanna, and Audrey I learned so much. They have been in this industry for so long and they shared their knowledge in subtle ways. I learned by listening to their stories, picking things up bit by bit. When I was in the pit with the walkers, David told me how to cry. He said to focus on a sad memory or something that might make me sad in the future. He said he would help me if I had trouble. But his advice worked. Alanna really helped me by teaching me how to read a script. MV: As I said earlier, you did a really wonderful job on The Walking Dead so I’m hoping that you’re getting a lot of work. According to your IMDb, you have a few things already nearing completion and something you are currently filming right now. Can you share anything about those projects? Anything particular you’re looking forward to seeing? Meyrick Murphy: I’m excited to see Chasing Ghosts, my second film, and see how I’ve transitioned as an actor between the time of Chasing Ghosts and Walking Dead. I also did a pilot for USA called The Novice, and I’m waiting to see if the network picks it up! It’s just all such an adventure when you see yourself on set and then it turns into a crazy awesome film in theatres or on TV. MV: Looking through those films, I noticed that at least two of them are horror. The Walking Dead falls into the horror category too. Do you like working on scary projects? What’s your favorite kind of movie or show to do? Is there something you really want to be in? Meyrick Murphy: I do like working on scary projects. It’s fun to be scared and hang out in the Makeup FX trailer watching people you know turn into monsters! My favorite kind of movie or TV to be in is, hmm, I would have to say something scary set in the 60s or 70s. It seems like it would be fun to run from things in bellbottoms! I would love, love, love to be in a Steven Spielberg movie! He is a great director, and I would love to work with him!! MV: Speaking of favorite projects, I understand you are an aspiring astrophysicist and that you like to study string theory. You’ve even done a monologue on atomic numbers! There are quite a few actors and actresses that have interesting skills and I think you’re the first one I’ve met that’s into astrophysics. When did you decide you that you liked it in the first place? Meyrick Murphy: Well, I used to watch Big Bang Theory and take notes. If I heard some words I didn’t know I would look them up and do research. Haha, I just love learning new things. In my gifted and talented class we could do a paper on anything and turn it in for extra credit. I got an A+ when I turned in my String Theory essay. I was very proud. I also love watching Through The Wormhole, with Morgan Freeman. I’ve watched the Higgs Boson episode at least a dozen times. MV: I was also on your Tumblr and one of the things I really liked seeing was how much fun you seem to be having in your day-to-day life. What do you like to do when you’re not studying string theory or acting? Are you still going to school as well? Meyrick Murphy: I like to paint in my free time. I attend music school and take Guitar and Violin; I love to play with my puppy, too! But art has always been a big part of my life. I just am so inspired to be an artist. I’m influenced by painters, musicians, and actors. MV: Last question: with The Walking Dead on your IMDb, you’re only going to get more popular over time. Do you ever think about one day being famous? What would you like to do if you were? Some people have certain directors or fellow actors they’d like to make a movie with once they become famous. Is there anyone you’d like to work with? 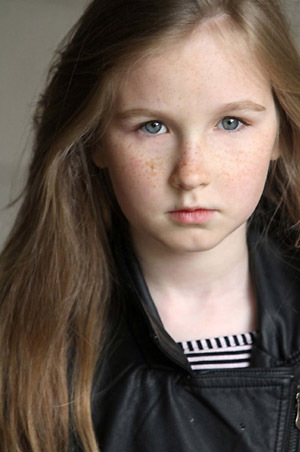 Meyrick Murphy: I would definitely love to be like Emma Watson one day. She is super intelligent and a great actress. She is one of my idols! I would love to work on a movie with Steven Spielberg, Emma Watson, and Matt Smith! That would be such a dream! Thanks for talking with me, Meyrick. You’re one of the first child stars I’ve met and it was a lot of fun learning about you. I wish you well in everything you do! Meyrick Murphy: Thank you so much! Meyrick is on Twitter, Facebook and Instagram. Other social networks are listed here. 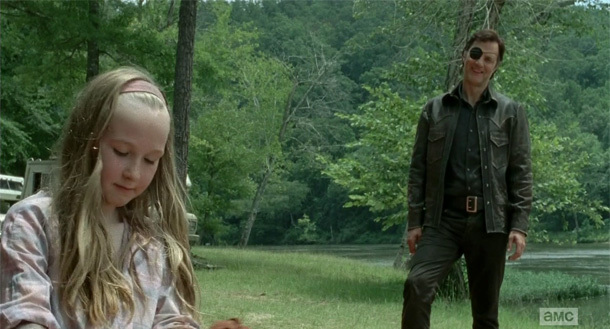 David Morrissey and Meyrick Murphy in The Walking Dead. Comments for Interview With Meyrick Murphy From The Walking Dead are now closed.